The Elbow of the Wall, originally uploaded by BlueBeyond. 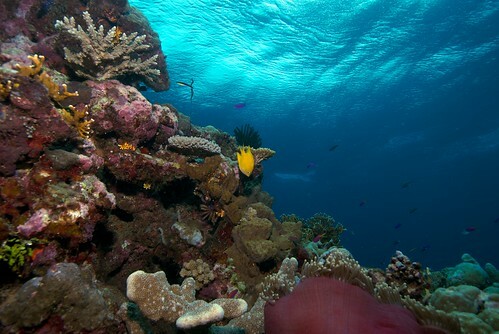 The wall dropoff at Elbow Point (near Uepi in the Solomon Islands) is a magical spot with rich coral growth, anemones, colourful fish and clear blue water. Pelagics are often seen here, but what captured my attention was the colours contrasting with the blue water. Thanks to PetaPixel for this blogging about this incredible footage of a manta ray swooping in and stealing a photographers camera gear, and returning it. I know that if a manta ray stole my gear like this I’d be really upset. Its a lot of gear to lose. I know I’d be happy to get it back, and I reckon I’d be even happier that the video recording was running.